Our grand old man has peacefully departed for greener pastures. We will miss him. We were fortunate to know him. Rest in peace, old friend. Boomer was not his nickname; it was his entire registered name, and he was born 3 years before the term was allegedly coined to refer to the post-World War II generation. He was a once in a lifetime horse that sired a wonderful family of sound, beautiful, willing, intelligent, laid back, versatile Morgans who are "forever" horses for their owners. We created this page for Boomer's extended horse and human family to post their recollections and observations; send us your photos and we'll include them. We didn't know when Boomer came to us back in 1977 that he would create an extended horse and human family, but it has been very rewarding to be a part of it. Below are a couple photos of Boomer with his best friend, Ken Harvey. Both of them drew people in, and they had a true bond in that way. Below are five generations of bay Morgan stallions, starting with Boomer's great-grand sire, Cinnamon King from the Morgan Photo Archive. 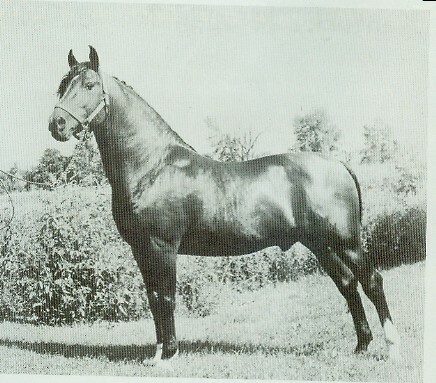 A Mississippi Valley Morgan Club newsletter from 1959 says, "The animation and action neccessary for the fine harness or 3-gaited Morgans was beautifully displayed by Ray Searls' Cinnamon King...." The same newsletter (1959) describes Boomer's grandsire, Durango, as "a very well grown mahogany bay yearling." Durango is pictured at Allbreedpedigree.com. Beauty's Banner (Durango x Suncrest Beauty), Jim Newton, handler. Boomer, age 10 (Beauty's Banner x VAS Tammy), Jim Newton, handler. Oldfield Sailor (Boomer x Flora's Lida Rose) at the 2003 Morgan Masterpiece with Alicia Witzke and Shauna Whitehorse Oldfield Sailor (Boomer x Flora's Lida Rose), Res. Western Pleasure Champion, Western New York Morgan Show 2007, owned by Robin Pelham. Boomer's sire, Beauty's Banner, was an in-hand, park saddle and park harness champion bred and owned by Harvey and Marge Luebke of Baraboo. He was the high point horse in Wisconsin (all breeds) in 1969, 1970, and 1971 at a time when the saddle horse and fine harness division dominated the show circuit. Beauty's Banner was expertly trained and shown by Jim Newton, who had worked with thoroughbreds and saddlebreds in Kentucky, before settling in Lodi, WI. Jim also showed Vern and Phyllis Albert's park saddle champion stallion, The Sundancer, which made for an interesting dynamic. The Luebkes and the Alberts lived about a half mile from each other in Greenfield township in Sauk County and had a friendly Morgan rivalry that lasted decades. It is fair to say that the Luebkes and the Alberts are responsible for practically everyone else in the sand counties who got into Morgans in the 20th century, including the Harvey family. Jim trained Boomer for us. Jim never went anywhere -- no matter what the posted barn rules said -- without a lighted pipe or cigar in his mouth and the smell of tobacco still makes Boomer stand at attention today. When he brought Boomer home from training he said, "Harvey, you have a $10,000 hoss there..." and that was a real compliment coming from Jim and a lot of money in those days! Boomer was only lightly shown due to an accident. He got cast in a trailer and injured his neck. He made it back to his stall with suppport from several men. After that he could not stand and lay in his stall on his side. Ken, who was nearly 70 years old by that time, watched over him and turned him over from side to side every four hours for almost two weeks so that his lungs would not fill with fluid. After about two weeks he said to Jean, "If that horse doesn't stand up soon, we are going to have to put him down because I can't keep doing this." And guess what? The next time Ken went to the barn, Boomer was standing. He eventually recovered his balance and gait and went on to his career as as sire. We had to geld a very promising big bay colt by Boomer for practical reasons in the aftermath of a barn fire in 2004, but we did collect him before doing so. He is Oldfield Sailor, who was born after Ken had passed away and is named for him. Sailor grew to 16 hands and has gone on to be a versatile champion with his owner Robin Pelham and Finger Lakes Morgan in New York. We are waiting for just the right mare to cross with Sailor. Stay tuned because this story is not over. Boomer's full brother, Tammy's Banner, foaled in 1975, was a stallion his whole life and was a big, four-legged babysitter for Gina Alexander, who taught her kids to ride and, apparently from the pictures below, to read, too. Tammy's Banner (Beauty's Banner x VAS Tammy) shown in 2009 at age 34 Tammy's Banner with Laurie Alexander, 1990 Laura and Banner -- reading "Justin Morgan Had a Horse"
The photos below bracket Boomer's breeding career and shows the Boomer stamp of beauty and useability still going strong after 20 years. Oly, from Boomer's second foal crop in 1984, is shown with owner Julie Phillips. Oly participated as the riderless horse in a memorial for Harvey and Marge Luebke. Boomer's sons Charlie and Higgins are shown in 2007 in the Bighorns. Charlie, right, is age 19 in this photo and is known as "the couch" for his smooth ride; he has logged thousands of trail miles, carried the flag in many parades and has been the mount for many first time riders. Higgins, left, had turned 3 the day before this photo was taken and is from Boomer's last foal crop in 2004. Charlie and Higgins are owned by Suzie Smith of Evansville. Suzie Smith is mounted on Higgins and Phyllis Anderson is mounted on Charlie. Suzie said, "I have never had such a strong, young Morgan as Higgins....wouldn't have taken anyone else on those rides when they were that young." Below is one of Boomer's daughters, THW Reba D, foaled May 2002, as a baby and on her first day hitched to a four-wheeled cart, a Pacific Phaeton. Owner, Lauraine Smith, whip. Lauraine has driven Reba at the Villa Louis Carriage Classic and many other events and notes that Reba, who is 15.2 hands, pulls the phaeton "like there is nothing behind." THW Reba D (Boomer x Bridlesweet Lady Diana), Lauraine Smith, whip. You might be noticing a trend. Boomer's sons were typically bay, although he threw a couple chestnut colts, and his daughters were uniformly chestnut. Rosie's Fleur-de-Lis (Boomer x Flora's Lida Rose), known as "Lily," is one of five full brothers and sisters from the cross between Boomer and our current matriarch, Rose. Lily is a flaxen chestnut 1996 mare owned by Tom Smiley of Cazenovia, WI. He reports that she is doing great at age 16 and is "the prettiest mare on the ranch." She has had four foals for him by Windmere Royal Topaz, a very popular and successful palomino Morab stallion, including RL Rosali, a palomino filly. Under the expert training of Wes Licht, of McFarland, and with Tom helping as groom, Lily and her son Ranger won the Midwest Distance Driving pairs championship in 2007. Below is Fitzmortimer BTO ("Fitz"), a 2002 gelding by Boomer, owned by Dolores Rohloff of Evansville, WI, hitched to a Glinkowski carriage owned by Lauraine Smith. The second photo is Fitz hitched with his dam, Bridlesweet Dot Calm, also owned by Dolores Rohloff, in tandem. This very well matched mother and son team have competed at Villa Louis and are clearly game for just about anything. Flora's Daisy, owned by Louise Heidt of Cambria, WI, is a 1994 liver chestnut mare by Boomer and out of Fieldstone Farah, "Flora". Louise reports that she is a "forever" horse, who has a bay Morgan daughter named "Lilly" too, and a bay granddaughter born just this May! Daisy was a very funny weanling. She was smart like her dam, who could open any latch or gate. There are always a few extra water buckets around a barn but at one point when she was a yearling, they ran out, and no one could figure out where they had all gone. Then we looked up and saw several buckets lodged in the rafters of the barn. It wasn't easy to make them stick either so she must have worked pretty hard at it. Boomer received excellent care and nutrition at Rustic View Farm from Dr. Dean and Wendy Meyer, his second home, and we thank them from the bottom of our hearts for making Boomer's retirement years healthy and happy. Boomer is 35 years old!